Manchester United target Ilkay Gundogan looks certain to leave Borussia Dortmund this summer after the club confirmed he will not be signing a new contract. The midfielder's current deal expires at the end of next season and Dortmund are likely to sell this summer rather than lose him for nothing in 2016. Bayern Munich, Arsenal and Atletico Madrid are also interested in signing the German international, who would command a fee of around £20million. 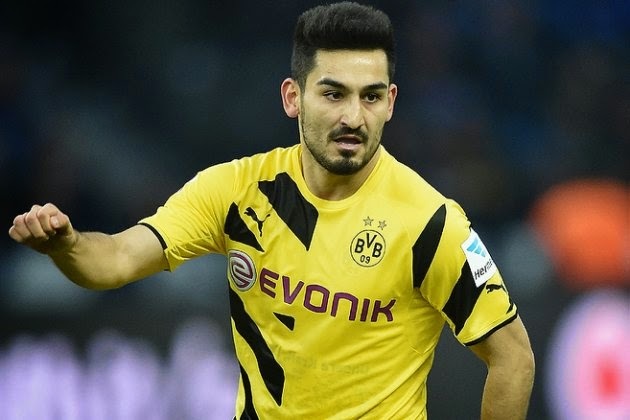 Dortmund confirmed on their official Twitter feed on Thursday that Gundogan: 'has decided not to renew his contract'. Gundogan joined Dortmund in 2011 from Nurnberg for around £4m. He won the Bundesliga and German Cup in his first season before reaching the Champions League final in his second. Injury saw him miss virtually all of last season and Germany's World Cup triumph but the 24-year-old has returned to form in recent months. Gundogan scored a penalty in the 2-0 German Cup semi-final win over Bayern at the weekend but the final looks set to be his last game at the club. United are looking for a world class midfielder to compete with the likes of Michael Carrick, Ander Herrera, Marouane Fellaini and Daley Blind.